What are its benefits for skin care? What type of shea butter should I buy? 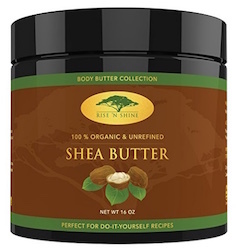 Raw, unrefined shea butter is rich in essential fatty acids and antioxidants. It helps moisturize the skin, fight inflammation, and slow the aging process. Shea butter makes an ideal lip balm, body butter, and daily facial lotion. It takes a lot of products to stay clean, moisturized, and beautiful. Wouldn’t it be convenient if you could get all these benefits in one place? Skin experts say you can — with shea butter. Intrigued? Read on to find out why dermatologists sing the praises of shea butter and regularly recommend it as a superior natural product with genuine healing properties. 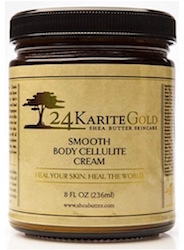 Shea butter is the beige, fatty matter from the nut of the African karite tree. Better known as the shea tree, it grows across West Africa, spanning a total of 19 countries. Since it’s derived from nuts, shea butter is categorized with other seed oils, although its health benefits are superior to any other known seed oil. 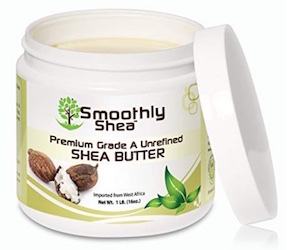 Shea butter moisturizes the skin without overloading the sebaceous glands and causing acne. This makes it an ideal lip balm, body butter, and daily facial lotion. As such, an increasing number of dermatologists are recommending it for topical use. The best shea butter has a smoky, earthy, nutty odor because it’s extracted from a tree nut via non-chemical, cold pressing. Some people don’t care for the smell, but it goes away 10 to 20 minutes after application. Refined shea butter does not have this odor and tends to be bleached white. Only authentic shea butter will give you the full benefits. You can find the American Shea Butter Institute’s seal on packaging for the highest quality products. Imported directly from Ghana, Rise ‘N Shine is void of any chemicals, additives, or fillers. It also comes with a 30-day money back guarantee. 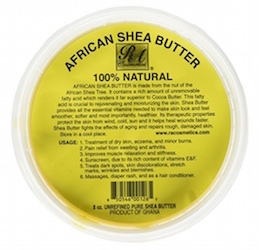 This unrefined shea butter also contains plant retinol, raw cocoa butter, and other natural ingredients. According to the manufacturers, results can be seen in as little as 20 minutes. Recommended by Dr. Jaliman, RA Cosmetics’ 100% Natural African Shea Butter is used in spas and resorts throughout the United States. Imported from West Africa, Smoothly Shea is 100% organic and certified by the ASBI. Its ivory color makes it suitable for all skin types and tones. Add it to liquid foundation to boost moisture in your skin. Use it alone or with an essential oil to alleviate inflammatory conditions. Apply it after being in the sun to restore moisture to your skin. Rub it over your abdomen during pregnancy to avoid stretch marks. Use it as an eyeshadow primer to prolong makeup. Massage it into your lips as a balm that offers some sun protection (SPF 6–7). Mix it into baby care products to keep baby’s skin soft and free of diaper rash. Apply it to scars to promote healing through collagen production. Rub it into your nails to soften cuticles. Apply it under your eyes to reduce bags and remove wrinkles. If your shea butter feels too thick, you can melt it over low heat until it reaches the desired consistency. But be sure not to let it reach the boiling point! That will destroy many of its beneficial ingredients. Also be careful not to use it beyond its shelf life. The American Shea Butter Institute warns that shea butter’s potency lasts for only 18 months after its extraction from the seed, so check the date on the container frequently. You can make your own all-natural body butter at home with just three ingredients: 1 cup of raw shea butter, ½ cup unrefined coconut oil, and ½ cup essential oil of your choice. Add the melted shea butter to a non-plastic mixing bowl followed by the coconut oil and essential oil. Blend the three ingredients for at least 5 but no longer than 10 minutes. Chill in the refrigerator or freezer for about 15 minutes until the oils start to solidify. Remove, blend the ingredients again, and return to the refrigerator. Repeat blending and chilling until the body butter appears creamy. Transfer the body butter to an air-tight container and store in a dry, cool place until needed. Although no adverse reactions to raw shea butter have been reported by people with nut allergies, it’s always best to consult with a doctor before using any skin care product for the first time. Also note that individuals with acne-prone skin may want to ask their dermatologist for an alternative to coconut oil, as it can clog your pores. » Want to know more about shea butter’s uses and benefits? Ask dermatologists questions and share your experiences on Zwivel’s skin care forum.